With the passing of the summer solstice last week, the year 2011 is technically half over (I know, already?! ), but plenty of time remains to radically change your life — and your world — this very year, and in remarkably simple but powerful ways. All it really takes to change your world is to rethink a few things. You see, for all the talking I do about the dangers of over-thinking and the problems that ensue from an unexamined ego, thinking is a remarkable tool. In fact, your mind might be the single most powerful tool you possess for not only realizing your potential, but literally creating a magnificent life — through your thoughts. The date on the calendar really doesn’t matter. What matters is making the explicit decision in the present moment — the now! The original title of this blog post was called “7 Brilliant Ways to Live in Accordance with the Tao in 2011.” But, what does that mean? Tao (pronounced like, “Dao”) is a Chinese word for “the way” or “the path.” Living in accordance with the Tao or “the way” means to live in harmony with everything: with nature and God, within your body, among others, along the path of life and as you make your way in this world. Striving to better understand the Tao has helped me reach some of my goals from the New Year, including to “live more deliberately and intently” and to push my own boundaries. I also wanted to explore new and unconventional practices for self-exploration and discovery, growth and inner strength. And so, I offer you this potent list of 7 suggestions — practices that I myself have put into practice over the last six months — that can help you live in accordance with the Tao, in harmony with everything, in 2011! Tai chi is an ancient “internal” Chinese martial art that I began to explore in 2011 in a very simple and pragmatic way — with a DVD that I received as a gift over the holidays (affiliate link // that’s the actual DVD I use). The workouts are not necessary calorie-burners, but do help get your blood pumping with the yoga-like stretch routines and gentle, synchronistic motions that are coordinated with your breathing — helping to quiet your mind and which provides a strong meditative effect. Short, energizing sessions of Tai Chi fill me with an incredible level of balance, inner peace, and pep in my step that help to carry me through the day and remain productive. Qigong is similar in many respects to Tai Chi — so much so that two Qigong routines are included in that same Tai Chi DVD I mentioned earlier. But Qigong is really stands on it’s own as a separate, ancient Chinese philosophy that explicitly focuses upon the manipulation of energy and the coordination of breath and movement for health and medicinal healing. The principle concept in Qigong is the manipulation of Chi energy — a life force energy that creates, sustains and runs through all life. Incorporating similar physical movement with mental training and a greater goal of inner, spiritual enlightenment, Qigong workouts are, while stationary, almost dance-like with its synchronistic flow between sweeping and elegant motions. Like Tai Chi, Qigong increases energy as well as a sense of inner balance, peace, and calm. And the meditative benefits cannot be disputed — they are the primary reason why I have maintained the sessions in routine. What’s to say about yoga that’s not already been said? The ancient Indian practice of yoga has exploded from relative obscurity to a mainstream obsession of tens of millions in recent years. Depending on your experience and fitness level, yoga can provide significant workouts and challenging routines or mind exercises that help to align mind, body and spirit. Yup, I yoga, baby. I’m by no means a yogi, but improving over time and have found yoga to significantly help improve my leg strength and flexibility — all of which helped me train drastically for my 9K road race in May. ChiRunning by Danny Dreyer is a book and revolutionary school of practice for distance runners that incorporates the principles of Tai Chi, including altering body position and momentum to move in harmony with nature (and the laws of physics). ChiRunning is especially helpful for those who experience pain when running. Never much of a runner, I gave ChiRunning a whirl, especially for my admiration of Tai Chi . I found the application of several simple principles to vastly improve my form and my mental mindset when running. With practice, I now run 4 miles at a time with relative ease and have never been better at distance running (or enjoyed running this much!). Since college, I’ve been fascinated with meditation. I began meditating sporadically to try to calm and quiet my mind during those college years. After getting away from what can become a difficult, frustrating practice — if you are not patient or naturally adept at calming your mind and zoning out — I’ve finally returned to meditation, thanks largely to a new tattoo that now adorns my skin! Written in Tibetan Sanskrit, “om mani padme hum” is a traditional Buddhist mantra that is recited during meditation to invoke reminders, blessings and strength from the essence of compassion. I got this bad boy around April on a relative whim, but with a deep appreciation and reverence for the mantra and its meaning. Just in the last couple of weeks, I’ve been practicing japa (mantra meditation) with prayer beads, also known as mala beads. The beads are counted once per each iteration of the mantra — no different than how a prayer is recited for each count of a bead on the Rosary in the Christian faith. I purchased a simple, affordable wrist mala made of Nepali bodhi tree seeds. 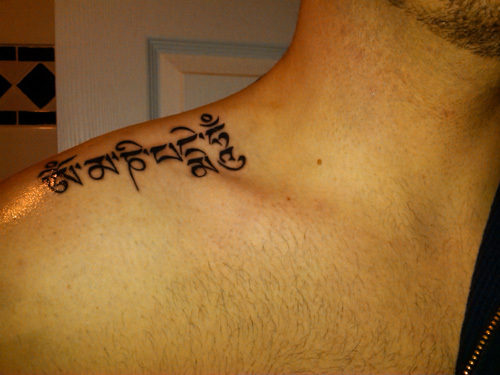 And how convenient that I already have my favorite mantra tattooed right on me! More than simple prayer beads, mala beads are believed to actually become “empowered” by the essence of a specific mantra when recited 10,000 times. I also handle my mala beads during interviews and conference calls, or any situation that might cause anxiety or tenseness — handling the beads reminds me of my mantra of compassion, calms me, and keeps me in focus with my purpose. We inhale and exhale breaths thousands of times each and every day — but seldom notice it. Mindful breathing is an inner practice through which we become “mindful” or conscious and cognizant of our breathing: each breath, in and out. Common in traditional Buddhist schools of thought, among other modern day relaxation techniques and exercises, mindful breathing focuses our attention upon the simple, immediate and present moment. It slows down our racing minds and helps us to find calm and peace within — with each deep inhale through the nose, and each calming exhale through the mouth. Mindful breathing returns us to the present moment. I really do attribute the practice of this list of 7 brilliant ways to live in harmony with everything — especially living in harmony within myself — to what has been a productive, happy, balanced 2011. On a physical level, I feel very healthy, strong, flexible and relaxed. On a mental level, I am nurturing positive emotions and releasing negative ones on a far deeper level than before. Emotionally, I simply feel great. But what I need to do is to ask you — what do you do to live “in harmony with everything,” or, in accordance with the Tao? Do you have any tips or tricks? Can you suggest some new, crazy things I haven’t even heard of?